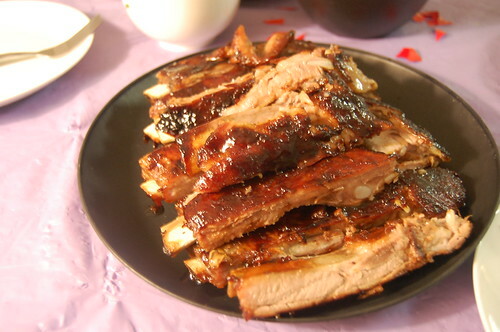 And here’s the ribs recipe that I made for Chinese New Year. With really tender meat just coming off the bone and a great, sticky caramelized crust, these were a big hit that day. The recipe was adapted from RasaMalaysia. Marinade – For the marinade, the measurements of the ingredients do not have to be exact. Instead, make sure that you taste and season according to your personal preference. Add all the marinade ingredients in a sauce pan on med-high heat and stir until blended. Cool. Rub the ribs on both sides with the chopped garlic and then marinate the ribs with 2/3 of the sauce, preferably overnight, though 6 hours should be enough. Preheat your oven to 325 degrees F. Line baking sheet with foil and place the ribs on top. Cover with another sheet of foil and roast for 2 hours. Afterwards, take the top sheet of foil off, coat the ribs with the rest of the marinade, and set the ribs under the broiler for 5 minutes, so the crust gets slightly charred and crusty. (This is where I set off the fire alarm in my apartment). Let the meat rest for about 10 minutes, and then dig in. You are currently reading Chinese BBQ Ribs at Notes on Food.